A new exhibition in London reflects our undiminished love affair with the flirtatious neighbour across the way. The bewitching magic of silvery moonlight belies the truth that the Moon's surface is as dark as asphalt. Both reflect only an eighth of the light that hits them. Perhaps humanity's lunar aspirations, too, are not shining, but dark. Apollo 11 astronauts left a plaque in 1969 which said, 'We came in peace for all mankind', but right now, with China's Jade Rabbit rover recently let loose on Mare Imbrium (the lunar Sea of Rains), nations are scrambling to be back and they seem to have resources in mind. Meanwhile, an international crew of artists have touched down on London's South Bank, and they bring us a timely warning. Calling themselves the Republic of the Moon, they have the most exquisitely eccentric of London's January exhibitions, and some points to make. She raised and trained eleven geese (named after astronauts) from birth for the job . . . The artists in residence, We Colonised the Moon, a.k.a. Sue Corke and Hagen Betzwieser, make their point about the Moon's future with a shopping trolley in the middle of their room — souped-up with moon-buggy-like wheels and solar panels, filled with rocks. Behind it, they've written on a blackboard: 'A THEME PARK OR A QUARRY? Well, jWC asked Corke, which is it? 'We think possibly both' she said, 'so we designed a Supermarket Sweep trolley'. Those rocks, she revealed, were coated with stuff that NASA had deemed similar to the lunar regolith (soil). The real regolith is far higher in Helium-3 than Earth, and since that substance is potentially a miracle ingredient that may enable nuclear fusion and solve all our energy problems, Betzwieser predicts it will attract quarrying — 'probably the Chinese' he reckons. These guys know what they're talking about. A previous proposal to disguise orbiting space junk as asteroids was brilliance itself — as Corke explained, if you're a space tourist 'paying $250,000, with say, Richard Branson, you don't want to see a load of old washing machines'. To take the orphan in the winter woods. Image by Leonid Tishkov. This Moon show is not without stars. Liliane Lijn, for example, has been a big name experimental artist since her Poem Machines in the 1960s, on which words rotated on drums and cones. 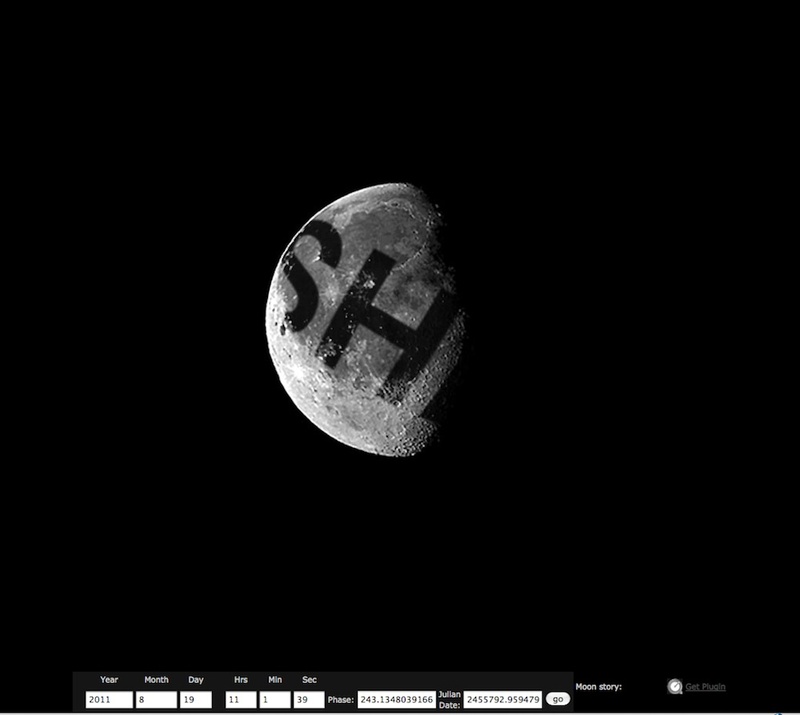 Here, her work moonme inscribes the word SHE across the Moon's face, and whispers it in the dark. The vision is just a simulation — the letters would need to be well over 2,000 km high. Her studio is just not that big, but her message is: she's reclaiming the Moon from men, resonating with its mythological role of feminine renewal, and maybe the menstrual cycle. A cycle is what Agnes Meyer-Brandis uses instead of a chariot in her project Moon Goose Analogue: Lunar Migration Facility. It's all based on a 1638 book by Francis Godwin (regarded by some as the first science fiction writer) about flying to the Moon on goose-power. In 2011, Mayer-Brandis not only raised and trained eleven geese (named after astronauts) from birth for the job, she made a surprisingly fascinating film about it, which with her deadpan Germanic commentary is not unlike a Werner Herzog documentary. There's also stuff like the geese egg shells and a control-room mock-up where the geese are monitored wandering over ersatz craters. The whole thing is a charming one-liner - in space, as any fule kno*, there's nothing for geese to breath and they would explode without spacesuits. Through a snowy forest, he makes a harvest offering of apples to it as it shines in bed, almost like a lover. There are other diversions here, such as Katie Paterson's piano playing Beethoven's Moonlight Sonata, despite data loss, after being bounced off the Moon in Morse code, and Joanna Griffin and her Bangalore students response to the Indian space agency ISRO's Chandrayaan Moon shots. There's a fantastic shop of Moon goods, stocking goodies from classic sci-fi paperbacks to NASA training sunglasses, run by East London hipsters super/collider. Agnes Meyer-Brandis, still from Moon Goose Analogue (2011). 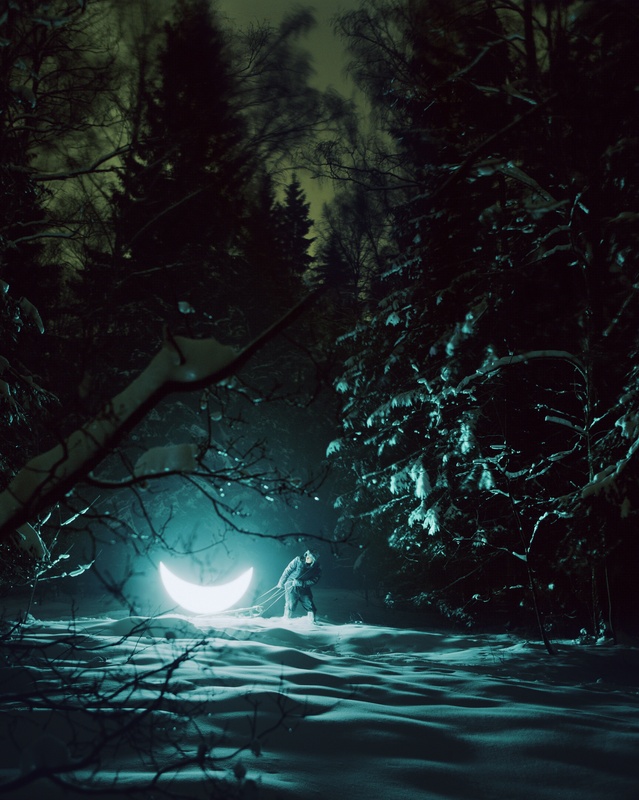 But the Republic's most enchanting element is Leonid Tishkov's exhibition of photos starring his electric shining cresent Moon in various locations, called Private Moon. Tishkov sits with his moon on a Moscow roof, he pulls it through a snowy forest, he makes a harvest offering of apples to it as it shines in bed, almost like a lover. In the Siberian waters of the Yenisei river at Krasnoyarsk, he films it floating. Yet how come the two-metre-long crescent moon that's on show at the Bargehouse isn't waterproof? 'I have many moons', Tishkov confessed, 'ten or twelve'. A Moon left pristine from humanity's grubby hands sounds noble, but maybe it needs perspective. Tishkov is on record as a supporter of Greenpeace's brave Arctic 30, the now-free activists arrested trying to mount Gazprom's Arctic drilling platform. But the Moon is not the Arctic: there is no climate change issue here. Nor is there any endangered species or natural habitat. In fact, in what Armstrong described as the 'magnificent desolation' of the lunar surface, there's bugger all except free solar power, minerals and Helium3. What to do with it all will be the subject of a symposium at the Bargehouse on Global Lunar Day, 1st February, with some serious scientists and policymakers. If we want the human race to survive (well, do we? ), a good insurance policy against catastrophe here, at home on Earth, is to spread into space. The Moon could be the key — a stepping stone, a resource, a place only 384,000 km away with which we can communicate in just over a second, while even the nearest planets preclude conversation because of the speed of light. Shouldn't we go for it, and make the dark side of the Moon also sparkle with cities and industry, and take the artists with us too? After all, something more beautiful than the Moon will wax and wane and serenade them in the lunar sky... the Earth itself.
. 11am-6pm daily, until 2nd February. Go here for more images of the show. Cover image by Leonid Tishkov. HERBERT WRIGHT is a London-based writer specialising in urbanism, architecture and art. He is Contributing Editor to UK architecture/design magazine Blueprint and contributor to others. Previously, he has written for magazines covering contemporary and twentieth century art, real estate, technology, and music. Recent work includes contributing to architectural encyclopedias for Phaidon, editing the London ICA website, and articles in journals in France, Mexico and Croatia. Herbert is the author of three non-fiction books about skyscrapers and urbanism. , Ch 5, p 47.